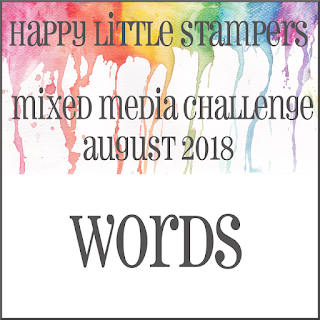 There's a fun technique challenge over on the CAS Mix Up Card Challenge blog this month! 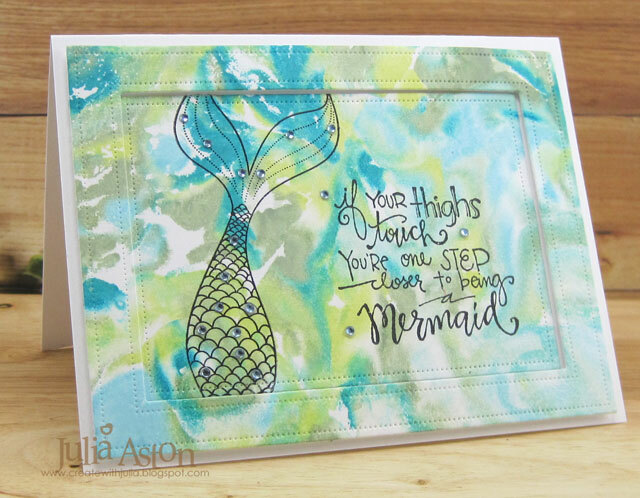 I was intrigued as I don't think I have ever heard of Layered Stamping with Heat Embossing??!! 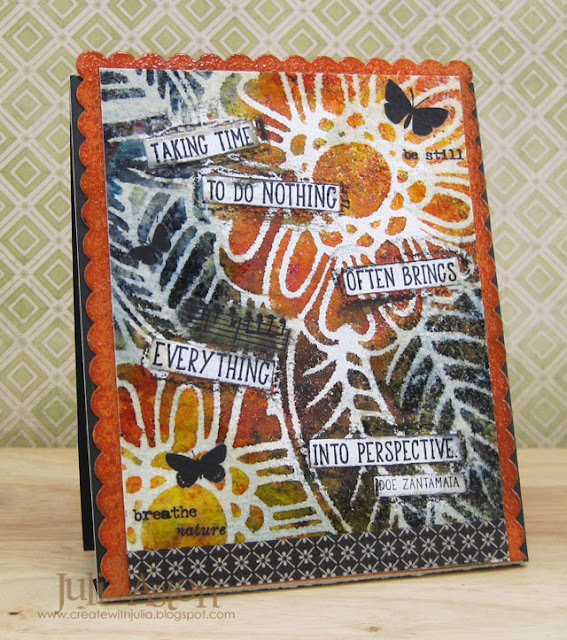 I used the technique Jennifer McGuire shows on this video that was linked to over on the CAS Mix Up Blog: Layered Heat Embossing. There are other links posted at CAS Mix Up as well. 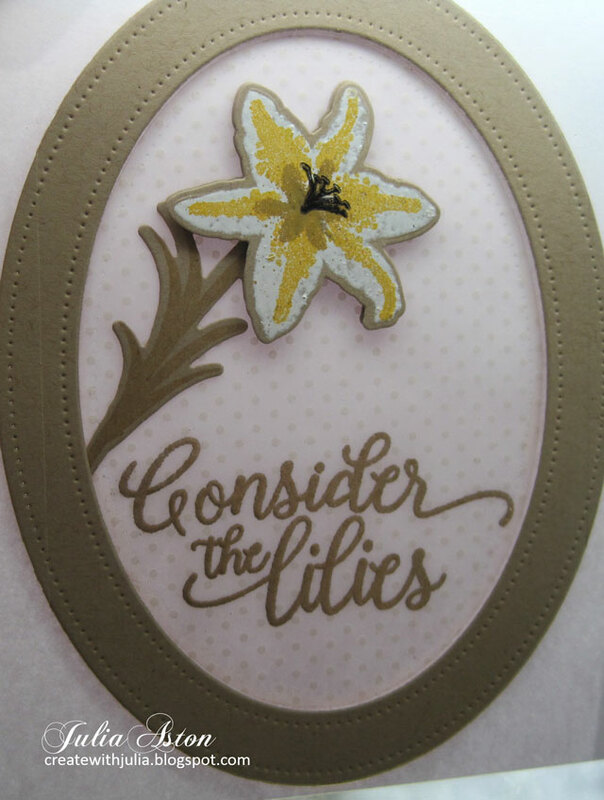 I just purchased the older PTI stamp and die sets called Lilies of the Field and it just happened to have 4 stamps for each lily - so it was perfect for this challenge! I die cut the lily and stem out of kraft card. 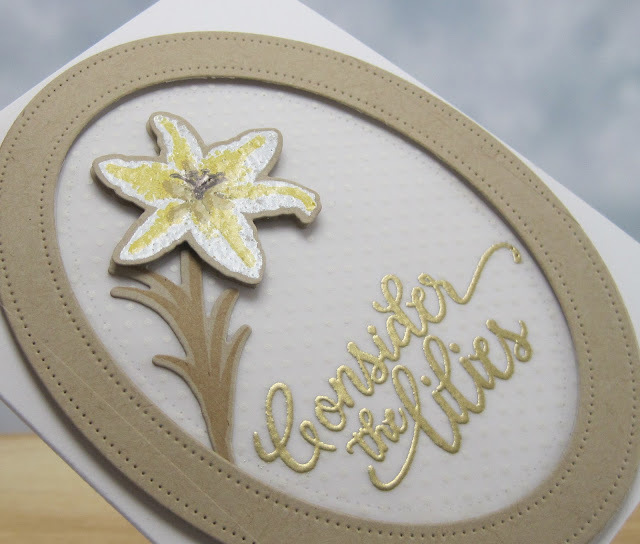 I white embossed the first layer of stamp, then I used yellow on the 2nd layer and tree branch on the third little center piece there. 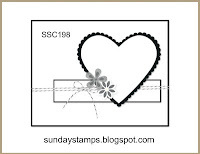 I stamped the final stamp (the stamens) in black ink . I die cut the PTI oval frame out of Kraft card as well as a dotted vellum (the inside of the circle - can you see the dots? It's pretty subtle.). I gold embossed the sentiment from Garden of Faith Sentiments. 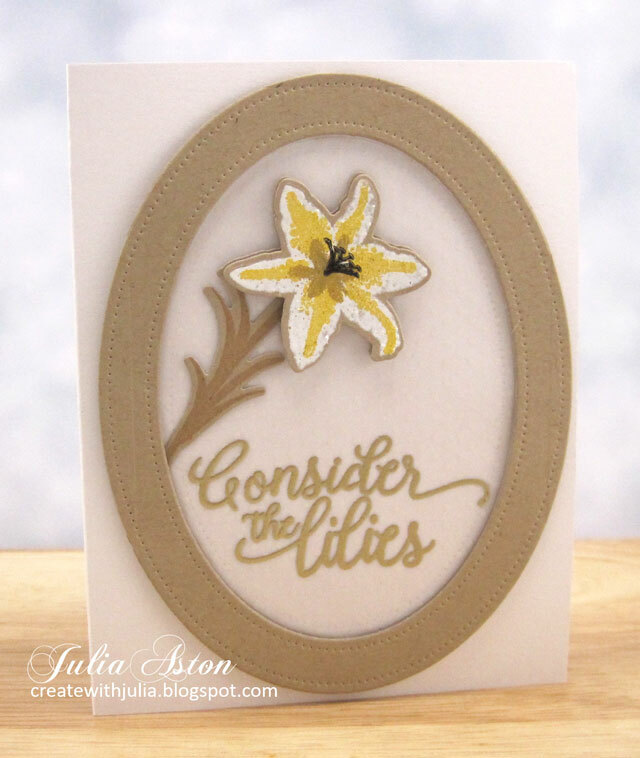 I popped up the outside frame as well as the lily blossom on foam dots. ETA: Another photo I took with my phone in the sunlight - hopefully showing the dotted vellum?! So this was a fun new technique learned and now I want to try it out with other stamps I have that have multiple layers! Ink: Versamark, Classic Kraft - PTI, Black Hero Hues. Accessories: Pierced Feature Frames: Ovals, Lilies of the Field Die Set - PTI, foam dots, Antique Gold Embossing Powder - Altenew. Wow - how did April get here so fast - although isn't it great to be coming into spring and saying goodbye to winter?! It's also time for the April CAS Stencil Card Challenge! 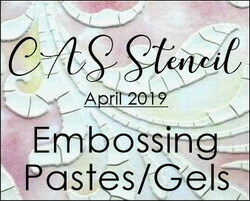 Barb is our creative host this month and she would like us to use pastes or gels with our stencils! 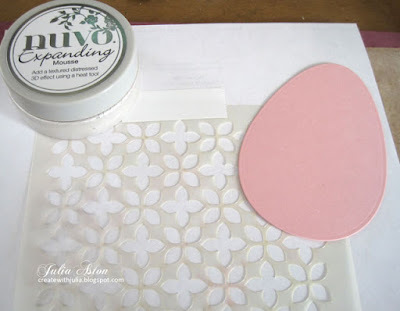 I was excited to get out my recently purchased Nuvo Expanding Mousse paste and try it out for this challenge. When you dry it with your heat tool, it puffs up! If you leave it to dry naturally - it's still thick but flat. 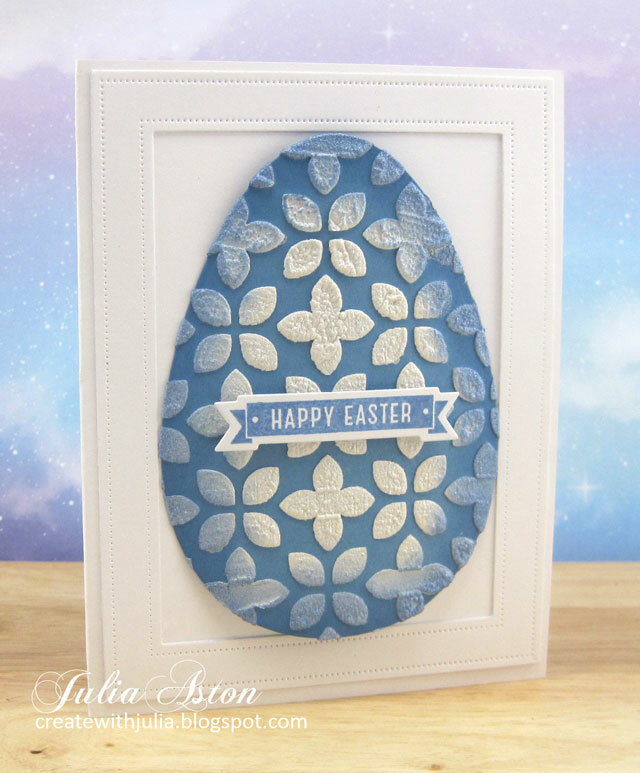 I decided to make Easter cards since I will be needing them to send out in a couple of weeks! I dried the mousse with my heat tool and it puffed right up, see below (if left to dry naturally, it dries flat, pretty much like it looks above.) 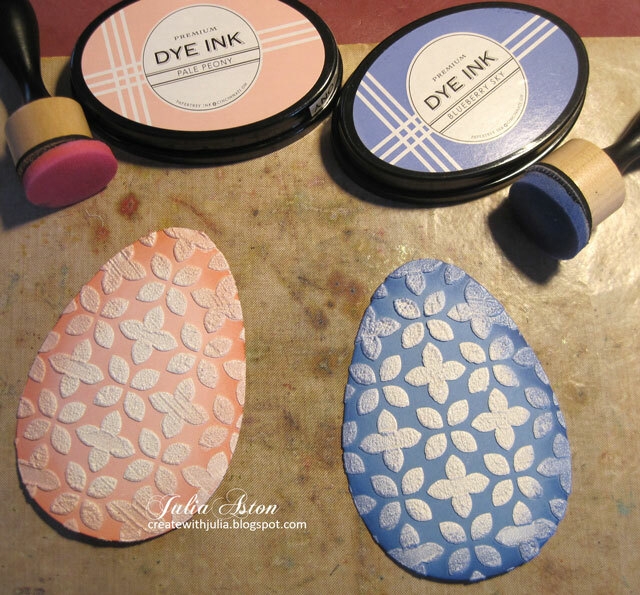 I sponged the edges of my eggs (I cut another one out of Blueberry Sky) with the matching inks to give them a little depth. I added 2 thick (3/16th") foam dots just to the center of the back of the eggs and I curved the edges of the egg down a bit. I adhered the die cut frame (Papertrey Ink) flat on the card base, then added the egg (with just the foam dots as shown above) I stamped and die cut the sentiment banner (Waltzingmouse retired) and layered it over the egg with regular thin foam dots. And here's the blue one! 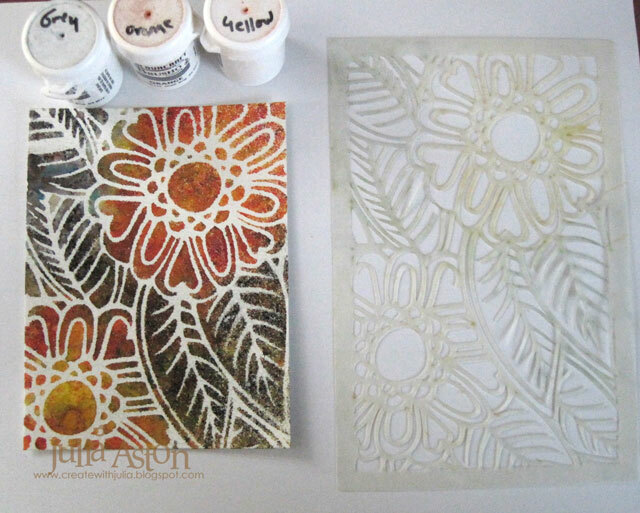 So please join us in April - and show us how you use paste or gels with your stencils. 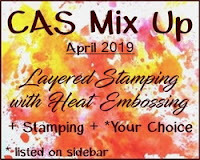 Link up your CAS designs at CAS Stencil - where you will find links to technique videos and wonderful inspiration from the creative Design Team! You have until April 24th. 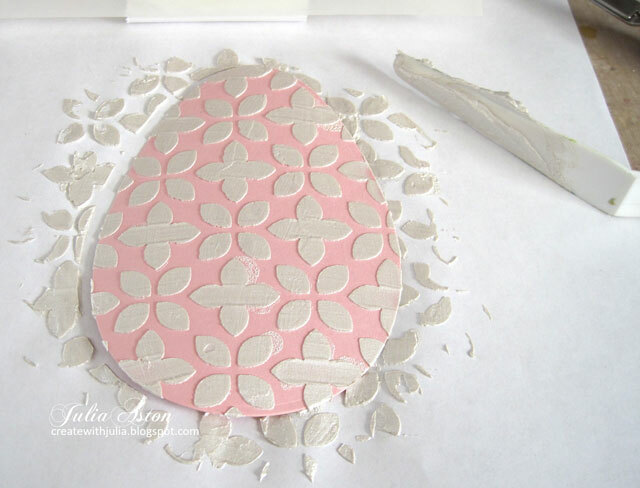 Accessories: Nested Eggs - Nestabilities, Good Egg Dies - Waltzingmouse (retired), Pierced Feature Frames: Rectangles - PTI, thick foam dots, foam dots, plastic spatula, heat tool, Nuvo Expanding Mousse Worn Linen, Abstract Petals Stencil - My Favorite Things (retired). 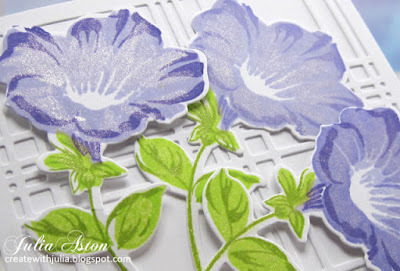 Today I made a card using the colors for the Color Challenge over at Splitcoaststampers - 2 purples and a green. I used lots of recently purchased items from Altenew - the Layered Plaid Cover Die A, Build A Flower: Morning Glory and the Morning Glory die set. I love when I use something new right away! So often I put new purchases in a drawer and then forget I bought them! I brushed the flowers and the leafy stems with Clear Glitter Wink of Stella which you can hopefully see in the photo above?! 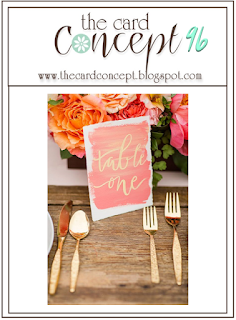 and I'm linking my card to their blog. Accessories: Layered Plaid Cover Die A, Morning Glory Die - Altenew, foam dots, Clear Glitter wink of Stella Brush. 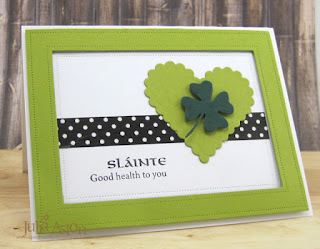 So I need to make some St. Patrick's Day cards for a sale at my church next month - people mostly buy the chocolate shamrock pops my friend Jeannine makes but some also want to buy cards. I looked to the challenges out in blog land for inspiration for my designs and, of course I found some! 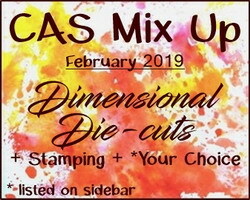 My first card design was inspired by the February CAS Mix Up Card Challenge. 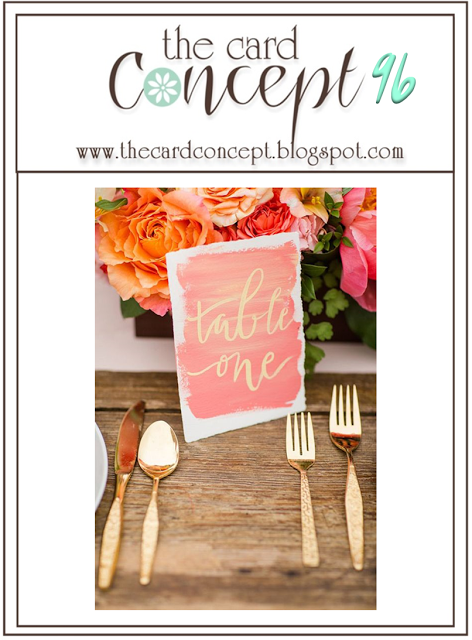 The Love Notes die from Reverse Confetti has score lines on it so the edges can be folded up to make the die dimensional - sort of little tray! I die cut it out of Translucent Alcohol Ink Yupo. I colored it by pouncing one the new Alcohol Pearl Inks called Sublime onto it. 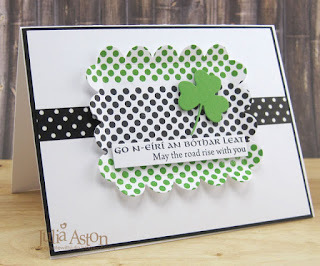 I stamped the sentiment from Irish Blessings (retired from Waltzingmouse) on a white strip and added a die cut Memory Box clover - both up on foam dots. 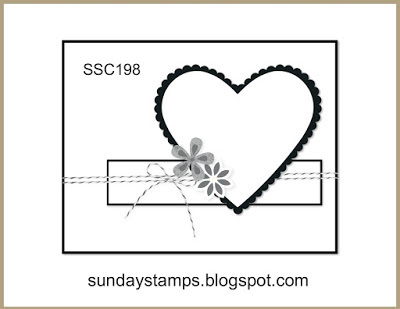 My second card was inspired by the Sunday Stamp Challenge. I die cut a scallop heart Nestability and layered a die cut clover over it. I put a strip of washi tape behind it. 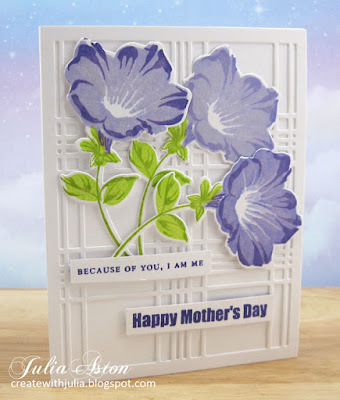 I used the Pierced Feature Frame Rectangle die from PTI for the background and framing. 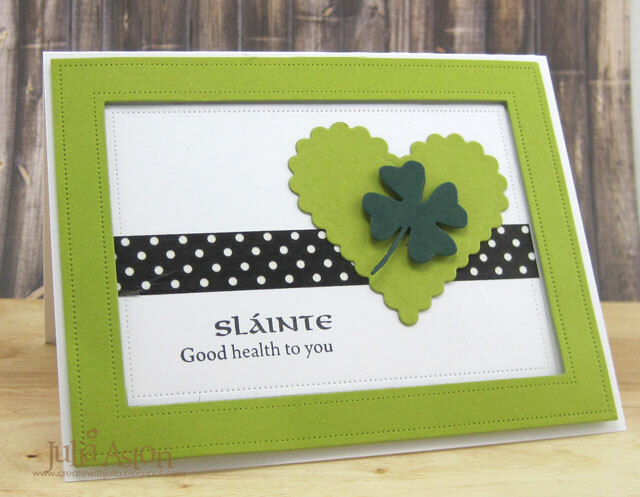 The sentiment is another one from Irish Blessings. 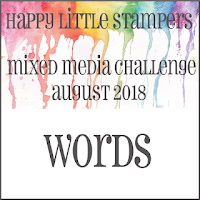 My third card was inspired by the Country View Challenges: Black and White Plus One color. 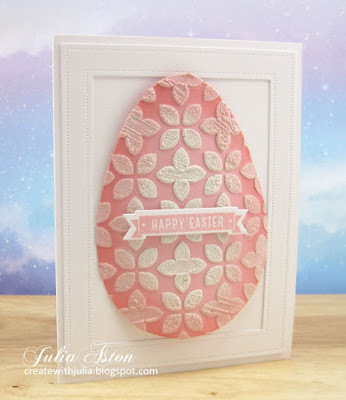 So this is very similar to my first card above but I stamped the circles on the white card die cut and added a piece of washi tape behind it. The sentiment is from Irish Blessings and the dots are from Off Beat Backgrounds - both retired from Waltzingmouse. So now I have 3 St. Patrick's Day cards for my church sale! 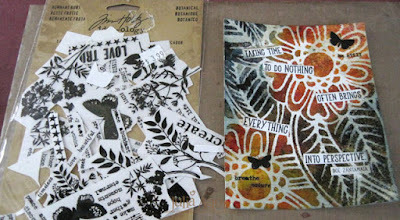 Accessories: Ranger Alcohol Pearl Ink Sublime, Lucky Leaves Die - Memory Box, Love Notes Die - Reverse Confetti, foam dots. Accessories: Scalloped Heart Nestability, Lucky Leaves Die - Memory Box, Pierced Feature Frames: Rectangles - PTI, washi tape, foam dots. Ink: True Black - PTI, Ranger Distress Mowed Lawn. Accessories: Lucky Leaves Die - Memory Box, Love Notes Die - Reverse Confetti, washi tape, foam dots. 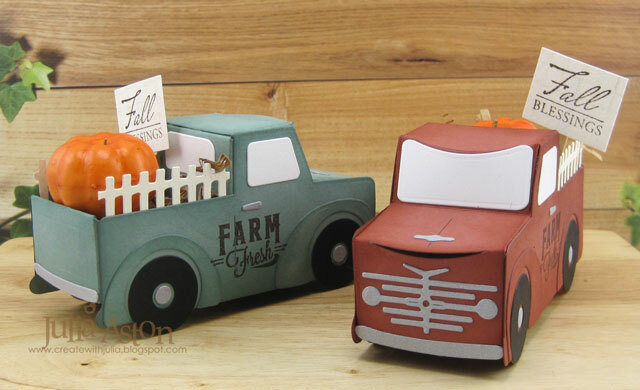 Papertrey Ink had this Pick Up Truck Die in their September release and I knew I had to buy it as soon as I saw it! How cute is this??!! It sold out in one day - (but you can click on the NOTIFY ME and they'll send you an e-mail when it's back in stock). 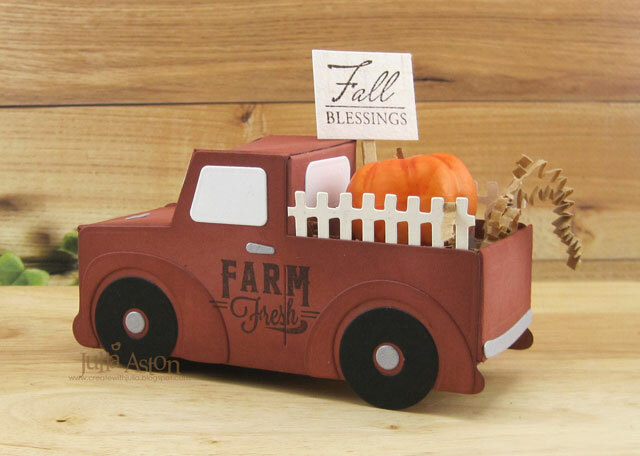 I'm making fall and Halloween cards and crafts to sell at my Church Fair in October and knew this would be a perfect item. It measures about 4 1/2" long x 2 1/8" tall at the cab and 1 3/4" wide. I die cut the fence from Village Bungalow (Tim Holtz/Sizzix) and trimmed it to fit in the truck bed. The Farm Fresh stamp is from Barnyard Sentiments (PTI) and the Fall Blessings is from Peace and Plenty (Waltzingmouse/retired) I attached the sign to a wooden stir stick from Starbucks cut to fit. The oversize pumpkin is from JoAnn - I bought a whole cylinder of them last year and never used them! It's the pumpkin that won the prize for being the biggest at the country fair! 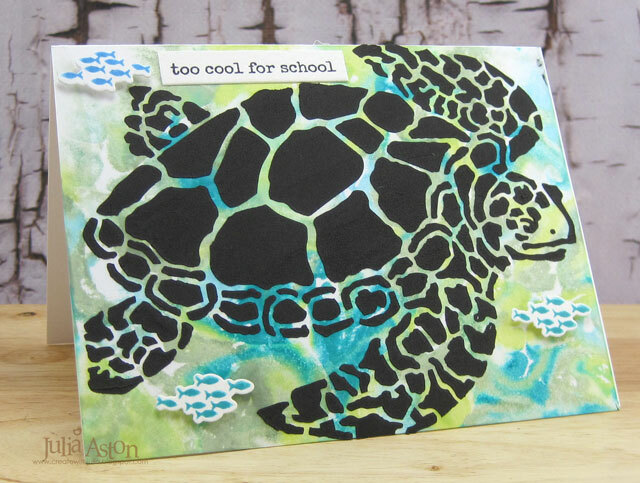 I've made 4 so far - two of them in Americana card and two in Ocean Tides card. 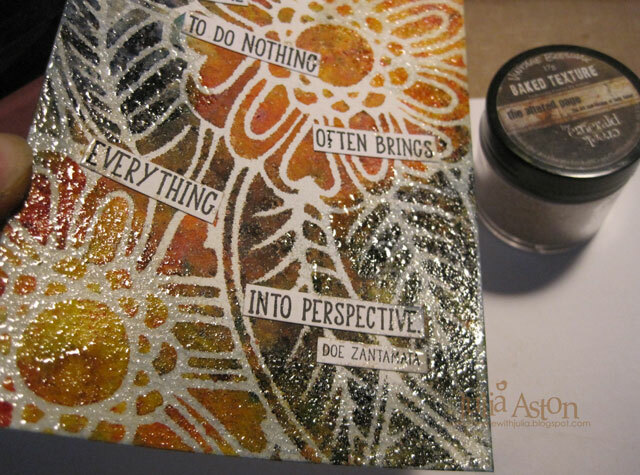 I sponged all the edges with the same color ink as the paper to give it an aged dimensional look. With a change of stampings and truck colors, I can make some spooky Halloween Pick Ups and some Christmas Pick Ups! Paper: Americana, Ocean Tides, White, True Black - PTI, Brushed Silver - SU, watercolor paper - Canson. 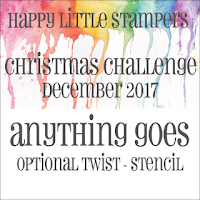 Accessories: Dashing Through the Snow: Pick Up Die set - PTI, Village Bungalow Die - Tim Holtz/Sizzix, Tombow Glue, ScorTape, brown basket shred, wooden coffee stirrer, little pumpkins - JoAnn. I have two cards to share today - both made with backgrounds created using the Oxidized Shaving Cream technique - discovered by Lydia over at Splitcoaststampers. She used it as the technique for the Mix Ability challenge on Friday. You will find her YouTube video here. So here's the first card I made for Lydia's challenge. I kind of covered up my lovely shaving cream background by stenciling this wonderful sea turtle from Stencil Girls over it using black embossing paste - but he looks perfect swimming in the ocean I created - along with 3 little schools of fish (the Friday Free 4 All challenge at SCS was back to school!) The fish and sentiment are from S'Whale stamps and die sets from Ellen Hutson. 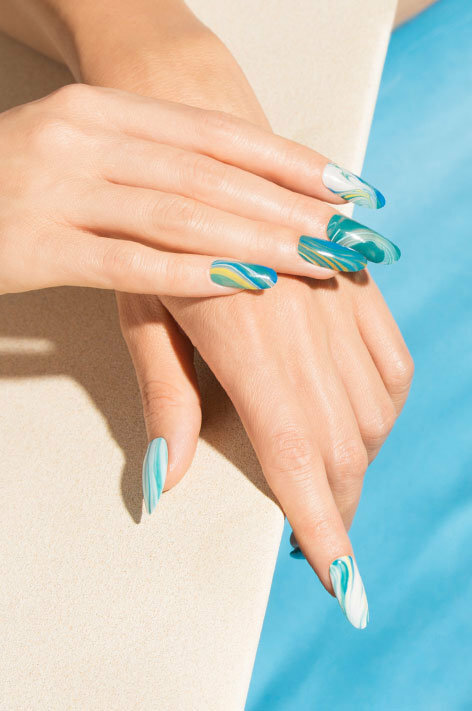 So then today's Inspiration Challenge at Splitcoaststampers was a nail polish website, OPI - and I chose this Marbled Waves manicure for my inspiration. Hope you are all having a lovely weekend - we are having intermittent sun and showers at the moment - but it's a hot summer's day! 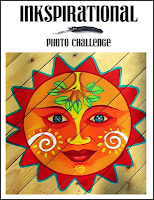 The July Challenge is up over at A Vintage Journey! Nikki is our hostess and her challenge is "Get Sentimental." "Let's see lots of sentiments on your project, whether they be words, poems or quotes. Just remember to create your project in our preferred styles of vintage, shabby, mixed media, art journaling, industrial, timeworn or steampunk." And here is my project! I started out by taking a panel of watercolor paper and laid the Artplorations Bloom Boldly stencil over it, taping it around the edges to hold it flat. I sprinkled Brushos over the pattern - yellow over the flower center, orange over the petals and grey over the leaves. Then I spritzed it with water to activate the Brushos. 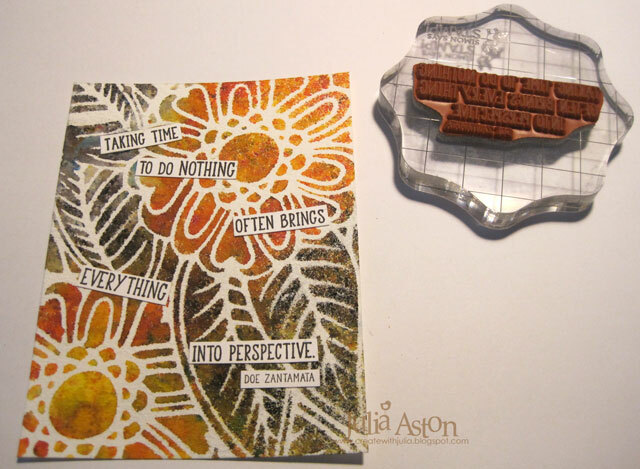 I stamped a quote from Impression Obsession in black ink on white card stock. Then I cut the quote into pieces and laid it over my panel. I adhered the pieces with glue to be sure it stuck over the Brushos. I rubbed the edges of the panel with Versamark and embossed with Vintage Beeswax Baked Texture by Emerald Creek. I drew around each of the quote pieces with a black Stabilo pencil and rubbed it with a damp finger to blur. I got out an old set of Idea-ology Remnant rubs/Botanicals and added 3 butterflies, a bar of music, and some words (be still, breathe, nature) to the panel. I also added a strip of black/floral Washi tape along the bottom of the panel. 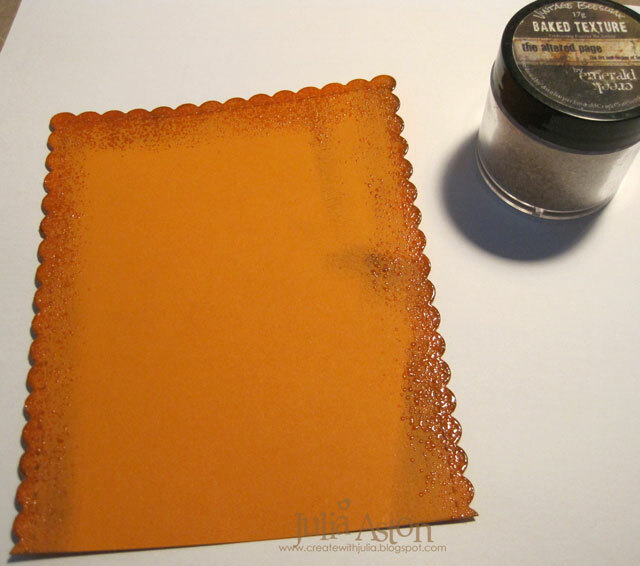 I die cut a scalloped edge panel out of Orange Zest card and embossed the edges in Vintage Beeswax Baked Texture to age it. I adhered the panel to this piece using Scor-tape. 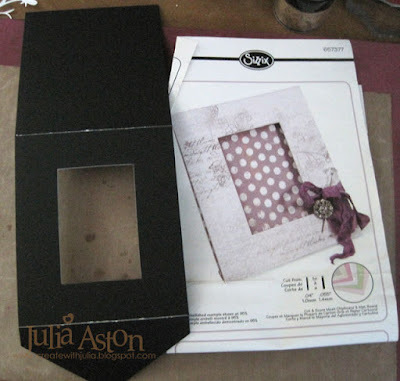 I die cut Eileen Hull's Sizzix Mailable Frame out of black mat board. I taped the cut out opening back onto the frame to make it a solid front. I adhered the panel to the front of the frame. Here you can see how the frame stands up for display. 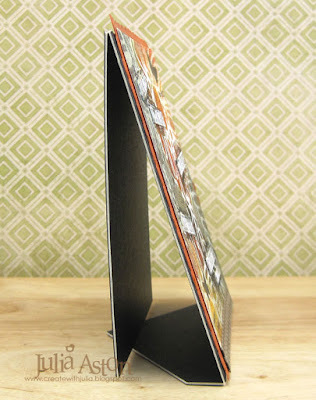 I love using this frame die to display special pieces - AND it folds up and fits in an A2 envelope for mailing! 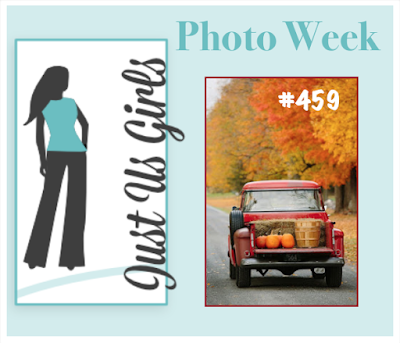 So please join us this month and "get sentimental! 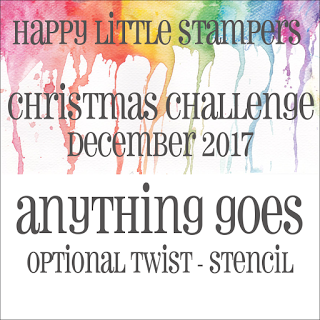 You'll find lots of creative inspiration by the Creative Guides over at A Vintage Journey where you can link up your own sentimental projects! 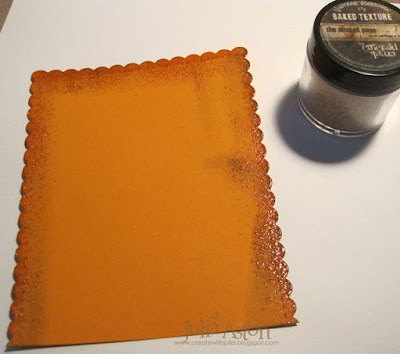 Paper: Watercolor paper - Canson, White, Orange Zest - PTI, Black Little Sizzles Matboard - Sizzix. Ink: Hero Hues Black, Versamark. Accessories: Brushos - Orange, Yellow, Grey, Vintage Beeswax Baked Texture - Emerald Creek, water mister, Bloom Boldly Stencil - Artplorations, Mailable Frame Die - Eileen Hull/Sizzix, Noted: Scalloped A2 die - Papertrey Ink, Black Stabilo Pencil, washi tape. 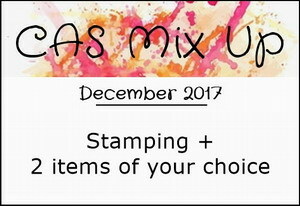 December CAS Mix Up - Mid Month Reminder! 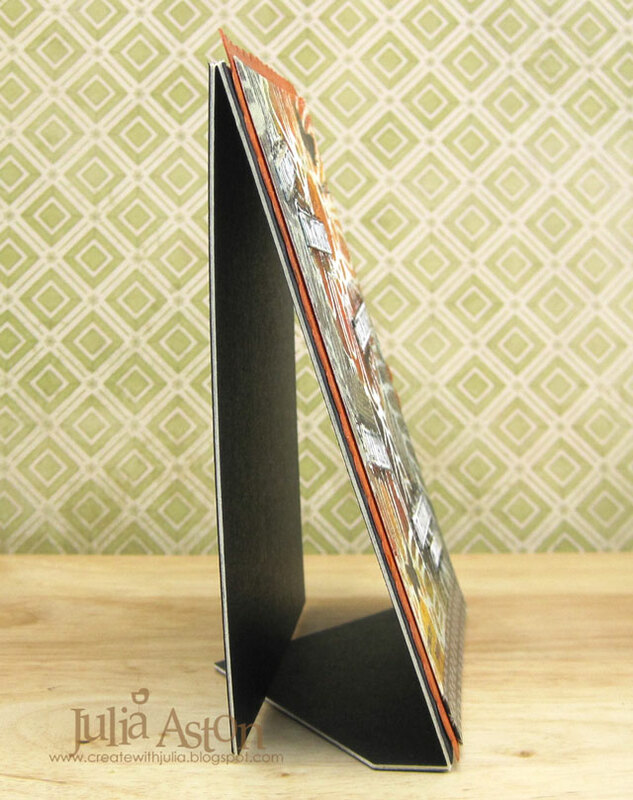 Ok, so maybe you need just one more Christmas card? or you already have enough (yay for you!) 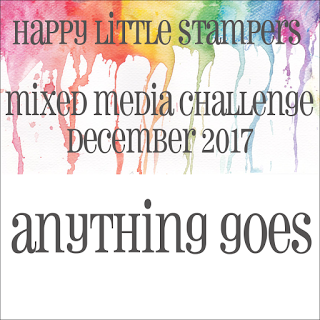 but whatever kind of card you may need - we've got some inspiration for you over at the December CAS Mix Up Challenge! You have until 12/24 to link up your card! 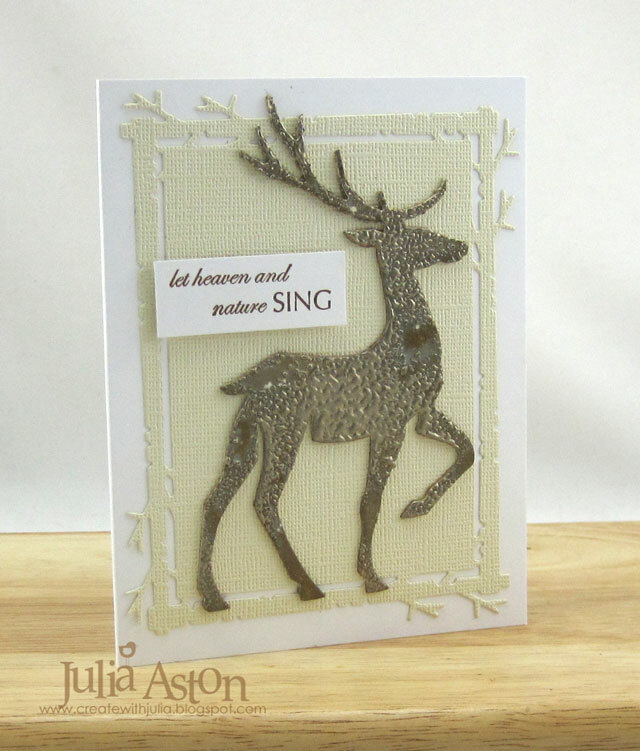 For today's card, I used: stamping, die cuts, heat embossing and sponging - while still keeping it CAS leaving lots of open space! I die cut the deer out of matboard and then embossed it with Platinum UTEE - Ultra Thick Embossing Enamels, it's something I had in my stash - but there is something similar available at Stampendous. Some of the thick enamel powder tends to blow off as you are heating it - so there were some white spots left on the deer. I just sponged over thespots with Ranger Distress Vintage Photo and Hickory Smoke Inks. Then rubbed the deer with a paper towel to remove the ink from the enamel. 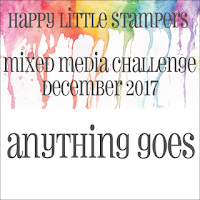 So I hope you will have a chance amid your holiday preparations to join us in the CAS Mix Up Challenge - you have until 12/24 to link up your card! Wishing everyone very happy and blessed holidays! 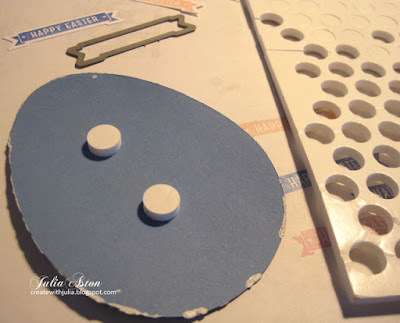 Paper: Cream Little Sizzles Matoard - Sizzix, white - PTI, cream- Coredinations. Ink: Cocoa Bean - PTI, Ranger Distress Vintage Photo and Hickory Smoke, Versamark. 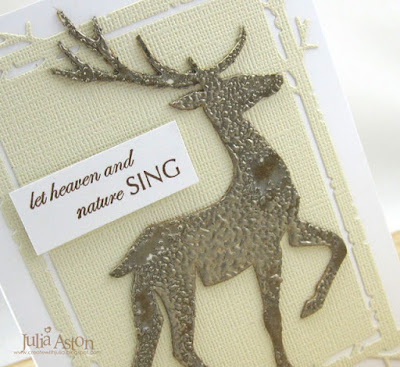 Accessories: Prancing Deer Die - Tim Holtz/Alterations, Mix and Mat Plaid Die - PTI, foam dots, Platinum UTEE Enamels, heat tool.